Did you ever believe that one day you would be reading that chocolate not only tastes good but is also good for your health as well? Well this is the day. However I do apologize to spoil this sensational information for you, but I need to point out that not all chocolate is healthy. The healthy chocolate is the one that you rarely see on the shelves of your local supermarket. You guessed it; dark chocolate. (I know, the title gave it away in the beginning). 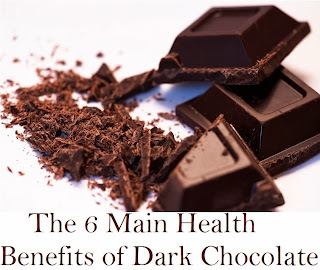 Healthy dark chocolate, the one which contains a minimum of 70% of cocoa (cacao) or more, is listed in the top foods (aka Superfoods) in which you can add to your healthy diet since it is packed with antioxidants. When consumed in moderation, this delicious treat has some very powerful health benefits which are listed below. Good For Your Heart - Improves blood flow which also reduces the risk of blood clots. By increasing blood flow, both the heart and the brain will always have a sufficient flow of blood towards them to keep them working normally. The flavonoids present in dark chocolate protect cells from free radicals, which are unstable molecules that damage the body's cells and organs. Flavonoids also lower blood pressure and reduce LDL cholesterol (the bad one) by up to 10%. Good For Your Brain - Eating dark chocolate as mentioned above increases blood flow not only to the heart but also to the brain, which boosts alertness and performance for as long as three hours. This mouthwatering confection also causes the release of neurotransmitters (endorphins) which "speak" to the brain feeding it positive information and forming new memories. Just a few bites of dark chocolate is enough for the chemical dopamine to be released which helps you recall people and events. Helps Control Blood Sugar -By keeping your blood vessels healthy, dark chocolate aids to protect against type 2 diabetes. The flavonoids increase the production of nitric oxide which helps reduce insulin resistance by helping your cells function normally and regain the ability to use your body's insulin efficiently. This unique type of chocolate also has a low glycemic index which prevents huge spikes in blood sugar levels that can be very dangerous. Improves Your Mood - Dark Chocolate contains phenylthylamine (PEA) which is the chemical that your brain creates when you feel like you're in love!! Have you ever experienced the creation of this chemical? PEA encourages your brain to release endorphins and serotonin. Endorphins are know to lessen pain, improve mood and relieve stress, whereby serotonin is the brain's "feel good" chemical that plays the part in promoting feelings of wellbeing and happiness. Reduces Stress - A Swiss study, (Switzerland is one of the largest exporters of chocolate that has to be noted) found that eating just 40 grams of dark chocolate every day significantly reduces your levels of cortisol which is the stress hormone. This "black magic" also contains the chemical serotonin which acts as an antidepressant. Protects Your Skin From The Sun - A research carried out in London found that people who ate dark chocolate for three months, took twice as long for their skin to redden when exposed to UV, compared to those who ate none. This is due to the flavonoids contained in dark chocolate that increases blood flow to the skin, improving skin complexion but also protecting it. Despite the health benefits of dark chocolate you must not forget that it is still chocolate which comes along with its excessive calories. A medium sized dark chocolate bar might not be as fattening as milk chocolate, but can still contain up to 250 calories, so watch your portion sizes. Enjoyed with moderation, you can add this superfood in your daily diet to reap the health benefits it offers. If today is the day that you want to change your lifestyle, then do it today, because the more you put it off until "Next Week", the less likely you are to ever start.